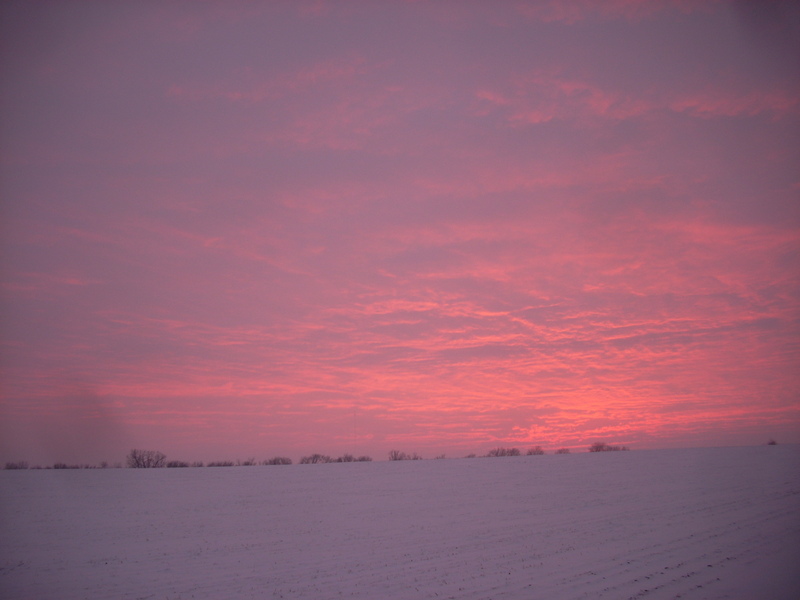 Ok, this is a winter sunset, but work with me here, it was pretty tonight too. So, off we went on a hack. I should be clear that these horses live out at pasture and are moving around all the time. They don’t require the same warmup that a stalled horse might. We walked for two minutes and then picked up a nice working trot for about half a mile of field edges, a bit of gravel road, over a bridge and into the CRP for a nice long canter. What a spectacular sunset, all the better when viewed from the back of a horse. We continued on our 2.5 mile loop, trotted toward home, walked the last bit, scrubbed their faces with the rubber scrubbie, gave them a thank you pat and cookie, turned them out and went in for supper. So, their tails weren’t perfect today and we didn’t clean the tack at the end. No we didn’t have them inspection-clean. Would we be this cavalier every day? Um, not so much. Was it infinitely better than watching Cash Cab while we waited for the chicken to cook? You betcha. The horse chiropractor was supposed to come today but he was a bit late. Ok, he was 2 hours late. God love him, he is the best I have ever seen work on a horse, judging from the horses’ expressions, but he has almost literally no sense of time. Well, I knew that, which is why I had the appointment scheduled at my house instead of at the clinic – so that I could ride or putter about the place while I waited. So I rode a training horse, who was a champion in ignoring the snapping drapes (partial roll-up sides on the arena) in the 45 mph wind, puttered about the barn doing some sweeping and doing a little tack cleaning. I didn’t want to tack up another horse, get into a ride and then have the chiropractor arrive 10 minutes into the ride, when I would have to stop. Well, then I got a call that we would have to postpone the chiro visit until tomorrow. So, I tacked up Eddie and rode during the time that I had set aside to be with the chiropractor. This meant that I had two and half hours! I don’t know about your life, but found time is rockin’ to me. So I tacked up. 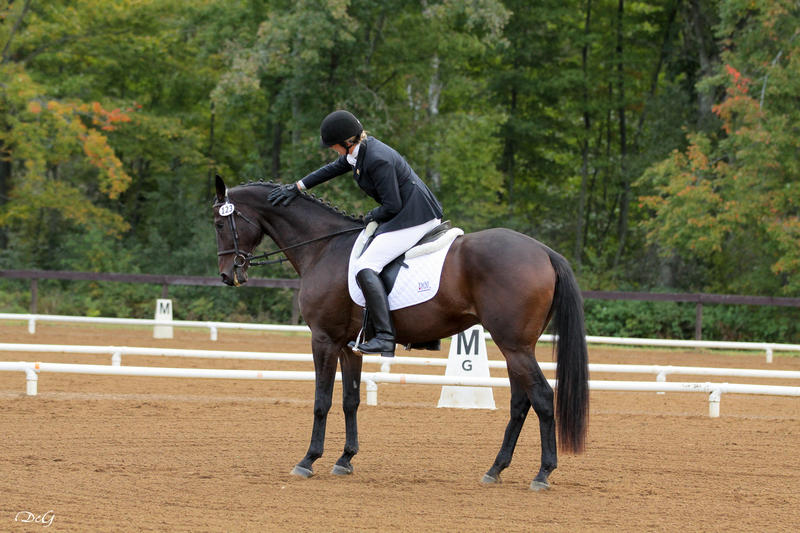 I got to thinking about the weekend and the basic difficulty we were having – tightness over the topline. It was directly mentioned in the dressage test, it played a roll in the turn (or non turn) to the corner on xc, and it played a big roll in showjumping. The judge’s comments on our dressage test had also pointed out a lack of acceptance of the bridle and acceptance of the leg. Very good points. We went back to square one. We started with walk and halt, and spent about half an hour on that. Then on to walk trot, and after another quiet half hour had that mostly in hand. Canter work is not even close, but we had a few moments of Not Bad. The best part of the whole day was that the number of relaxed breaths from Eddie dramatically outnumbered the tension snorts that he will let out when confused. Much praise and done for the day. We’re on the road back. My wonderful farrier managed to come out yesterday and look at Elliot’s hoof. Elliot has what my vet diagnosed as a “close nail”, not exactly a hot nail, but close enough. In my farrier’s defense, the horse has shelly, thin hooves and is tough to shoe. He’s been shoeing him a couple of years now and this is the first incident. That’s pretty dang good. So we took the nail out. Elliot was improved, but not really right. So last night my farrier came out again and dug around in the hoof. I don’t know about you, but it always amazes me to watch someone really dig around in a hoof. Hooves are so rugged and yet so fragile. Such a delicate balance of strength and elasticity. 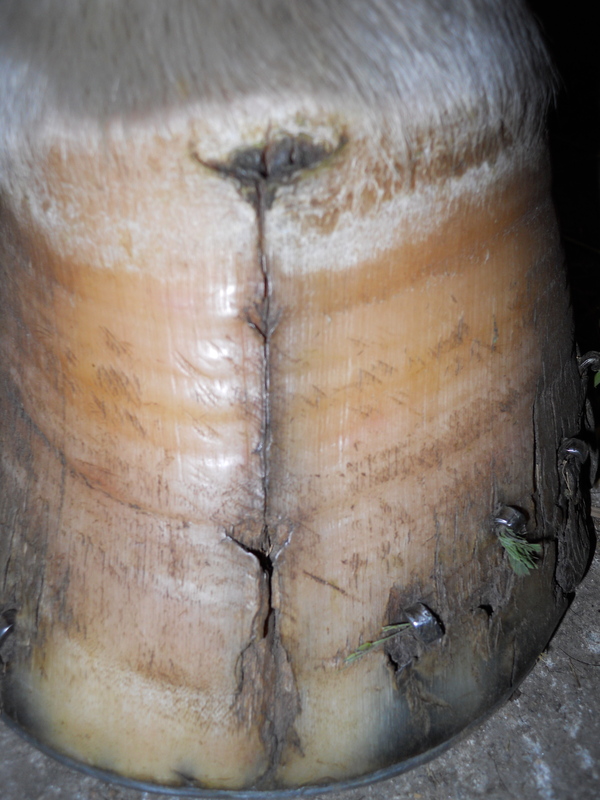 My farrier spent a good half an hour hoof testing and considering, digging a little, modifying and digging some more. Lucky for me, a few weeks ago, I bought some of these hoof wraps. They seemed like a really good alternative to the duct tape contraptions we all make. So, just as my farrier was launching into the ‘soak, sugardine and duct tape boot’ spiel, I produced the hoof wrap to his nearly dumbfounded amazement. I was lookin’ like a dang genius. He put it on and it stayed on until this morning when I took it off during breakfast, for a soak. See? Money can buy happiness. I held Elliot’s breakfast for him while he stood in the cross ties, left front leg dutifully parked in the bucket of warm water and epsom salt. There is something really endearing about holding a feed pan for a horse while he eats his breakfast with single-minded zeal on a cool autumn morning, chasing the little bits around the pan, snuffling with pleasure. After his breakfast, I still had 15 minutes left on the soak. Everyone else with hooves had left the building, headed back out to the pasture. So it was just us. I groomed Elliot, brushed his face, trimmed his bridle path, primped his mane and tail, fed him cookies and marveled in his horsie fabulousness. I was invited to just spend time, rather than rush on to the next thing. It was among the most thoroughly enjoyable 15 minutes of this week. If you’re familiar with the Black Box and the Gold Box, then you know that one of the keys to using them is to examine the positive and the negative before letting experiences go into the boxes. So today I edited the video that Jay shot of the dressage (not bad, but nice room to improve), xc (the fun of it is in the Equanimity post) and showjumping (there is one good jump of 5, irrrrrg). I took the 8 seconds before and including the departure from Eddie on xc, and all of the showjumping, edited it together, saved it in slow mo, and watched it about 45 times. The first few times through was like putting on a wet bathing suit. There is no lying on videotape. I enlisted the help of a glass of wine. I learned a lot. If you’d like to see the video, simply send me a request on a note attached to a new Berney Dublin Jumper saddle. So, yeah, that didn’t work. You may recall yesterday’s blog about the impromptu test run of the air vest. This scientific foray, of course, caused me to be eliminated from the horse trial competition. 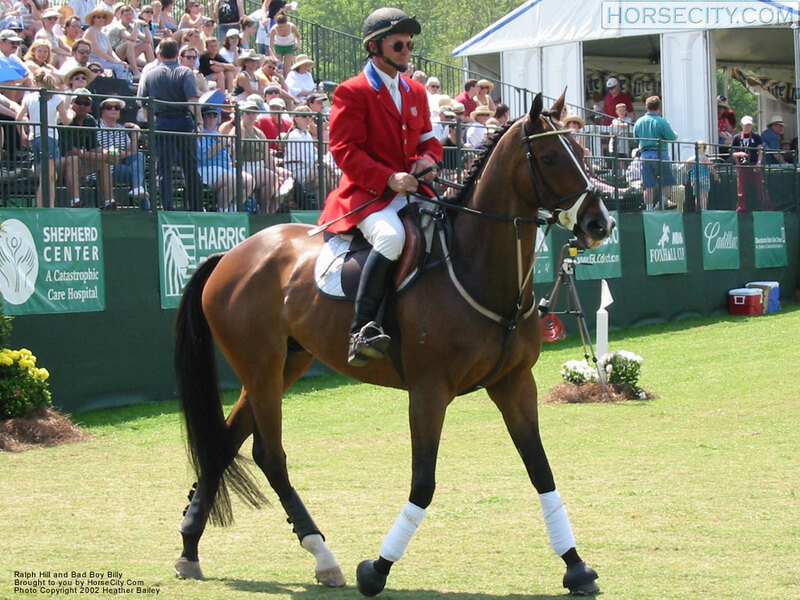 After cooling Eddie out and freshening up as much as a change of clothes and a deodorant shower in the trailer tack room can offer, it was my time to do that groveling walk of shame to the President of the Ground Jury (POGJ) to ask for permission to ride showjumping the next day. “So, how’d you get eliminated?” sayeth the POGJ. So this morning I warmed up with the people actually still in the competition. Eddie was really very good. I executed all the skills that I and Kyle Muckler of Maffitt Lake Farm have been installing in the last few weeks. Eddie was jumping beautifully. I couldn’t miss a distance. I was fired up for what I thought would be a very nice showjumping round. We walked up to the show ring and Eddie started to get tight. And I mean tight. Clicking his teeth, tight in his back and neck, short strides. I did some bending exercises and he improved. We went into the ring and he went feral. No button I was pushing worked. There was no bend, no yield, hell, no true canter. There was a skittering, scared-puppy-peeing-on-the-carpet feeling underneath me. I thought he would get better as we got moving, so I went on and cantered down to fence one, a nice square oxer, which he is great at. I made sure I was riding well down to it. He jumped it very well in front, and pulled the rail with his back hooves. “Seriously?” thinks I. “That’s a gimme for you.” Fence two, he jumped in stride, but also pulled the rail, jump three the same. He crawled over 4a, the oxer and of course, pulled it, put two strides in the one stride line and jumped pretty much through 4b. I was pulling him up to retire when I heard the whistle blow, which of course, was the POGJ telling me to quit scaring the spectators, and also to assist the jump crew by exiting the arena now since they were going to have half a day’s work to put my flying timber back up. Sorry. So, we went back to the warm up arena and jumped a few jumps which went perfectly fine. Clearly, the atmosphere was the problem. 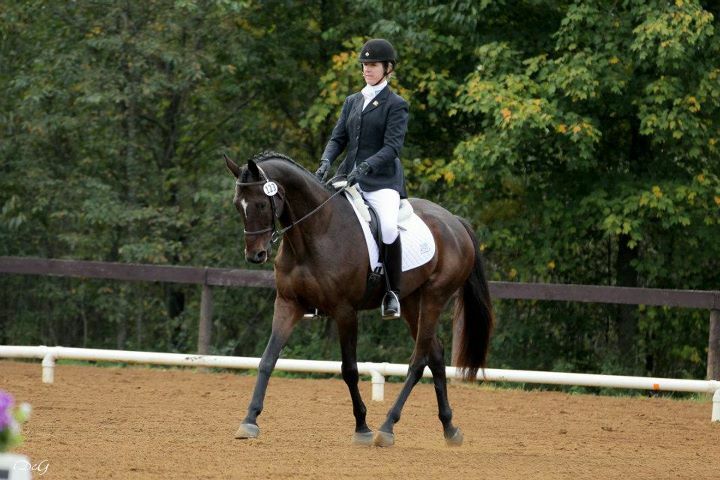 Back when he was learning to event, I spent 2 years at Novice level to get him to relax. I remember his first novice level event. The spectators laughed appreciatively at his deer jumps and audible expressions of tension. They cheered lavishly when he completed the course, and I grinned in thanks to them and praised Eddie like he won the Olympics. Everybody’s ridden a greenie around a course and most can appreciate the palpable victory in simply getting the frightened child horse around the course. I had a lot of fun bringing him along, so I actually forgot why I spent so much time at the lower levels with a 17 hand thoroughbred who could jump a small house. I did it because Eddie needed it. In the interim sunshine of the success we’ve had at Prelim, I forgot his basic nature. Then, the two years he had out of competition have allowed his confidence to atrophy. His jumping is fine, as evidenced in warmup. I had no show nerves since I wasn’t competing today and really had no dog in the fight. So, I’m not going to wear the direct riding fault for this one. If there is a fault, it is that I forgot Eddie’s general nature. Had I reviewed where we started, and suspected he may have needed a ramp back up to prelim, I would have started him back at a lower level of course. I need to remember his nature. He needs to remember he is a star. I fell off a 17 hand cantering horse today in public and even screeched like a little girl when I was airborn. Yep, galloping and jumping over solid objects on a good horse is way fun, and yes I have video of the fall and no, I’m not uploading my happy self launching in to space for ya’all to see. 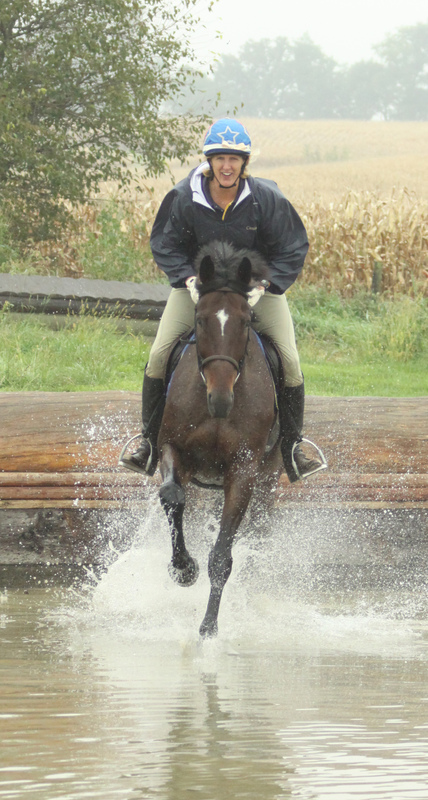 I haven’t ridden Prelim level eventing in two years and today was my day to get to do it again. I’m still grateful I got to do it, though I do wish I could have ridden the rest of the course. The fall happened because I didn’t ride the 5 stride bending line to the corner correctly. Eddie was a rock star, it was total pilot error. The Point Two Air Vest we bought me is the best. It worked flawlessly, and because of it I am not sore anywhere. Terrific. Eddie felt fantastic in warmup and on course. After fence 5, the Otter in the Water, Eddie landed and accelerated like a jet cleared for takeoff. He got back in the game of running xc – land and go. Loved it. He galloped like a rock star after that. Part of me wishes I could bottle the feeling of galloping with a 17h thoroughbred I know and love, and part of me is glad that it can’t be bought. I got to warm up with Ralph Hill. I just asked him since he was just standing there. He was delighted. I was delighted. I tried to pay him, he didn’t let me. If you don’t know who he is and you event, you are missing out on a real treasure. Google him or get in a clinic with him. Stellar guy. So. to those of you who read the ‘RF’ today after my name in the live scoring, thanks for your calls, your emails, your texts and your genuine concern. I’m fine. I’m actually pretty psyched. Why? Because I didn’t get hurt, my horse didn’t get hurt, I didn’t hurt anybody else or me by being frustrated or acting like this is a world-ending big deal. I’m actually a bit proud of myself for that. And I worked with Ralph Hill, had a few laughs with hubby Jay, talked with some friends and made some new ones. And I get to showjump tomorrow. Woohoo.